IN CASE YOU DIDN’T KNOW …. During the week of Adar 23-29, the Mishkan was erected each morning and dismantled each evening; Moses served as the High Priest and initiated Aaron and his four sons into the priesthood. Then, on the “eighth day” — the 1st of Nissan — the Mishkan was “permanently” assembled (that is, put up to stand until the Divine command would come to journey on), Aaron and his sons assumed the priesthood, and the divine presence came to dwell in the Mishkan. We must think that during that night at Gethsemane the thoughts and feelings of the God-man encompassed all fallen men in their many billions, and wept with loving grief for all of them individually, which, of course, was only possible to the Divine, all-knowing heart. This was our atonement … We are sure that the terrible sufferings of the Saviour at Gethsemane took place while beholding the sinful life and sinful nature of all human generations and that the words of the Lord “Let this cup pass from me” are not pointed to his upcoming Crucifixion and death, but to this, completely depressing to Him, feeling of profound grief for the sinful human race so beloved by Him. The tradition of asking forgiveness on the last Sunday before Great Lent dates back to ancient Egyptian monasticism. Their life was not an easy one: when departing into the desert for the entire forty days of the fast none was certain that they would return from their solitude. Therefore they would ask forgiveness of one another, as before death, just before leaving. Do we know what true, profound forgiveness is? How it differs from reconciliation? How to prepare for Forgiveness Sunday and for the Church’s Rite of Forgiveness in such a way as not to reduce it to a formality? Priest Andrei Lorgus, Rector of the Institute of Christian Psychology, responds to these questions. Reconciliation can be achieved through various means, including through material means. I can cause damage to another person and can subsequently reconcile with him through some action of a sacrificial nature: I can give him money or provide him with some service in order to achieve reconciliation. But this will be neither forgiveness nor repentance. All the same, the Church has foremost in mind not reconciliation, but forgiveness: moreover not so much receiving forgiveness, as asking for it. On Forgiveness Sunday it is much more important to offer repentance to another – to say, “Forgive me!” – than it is to receive forgiveness. I think that the ancient tradition of asking forgiveness of one another before Great Lent implied primarily this half, this part: not reconciliation, not receiving forgiveness, but namely asking for forgiveness. Of course, this asking combined both personal repentance and asking something of someone, while the important thing was not so much asking forgiveness of him so much as reconciling with him in one’s soul. Even if this person is very unpleasant, even if this person wishes me harm, even if this person is ready to manipulate and laugh at me… I need this! Asking forgiveness of him and becoming internally reconciled: I need this; this is my spiritual exercise; this is the beginning of my Lenten repentance. Yet very often people think that if I ask forgiveness of someone I will still owe him something: that after this I must become his friend, I must become close to him, I must become family to him. But this is dangerous. What if he begins again to laugh at me, to mock me, to humiliate me? One must bear in mind that asking forgiveness, reconciling with him in one’s soul, by no means implies communicating with him later, because the decision to reconcile internally does not correspond to the decision to carry on some sort of close relationship with him later. I can ask forgiveness, all the while deciding for myself that I will no longer have anything to do with this person, because he is dangerous and wants to mock me – or simply because I no longer see any prospect of communication. This is my decision and my responsibility. Therefore forgiveness by no means requires that one become close to this person. But if this is a loved one – and, as a rule, we sin above all against our loved ones and relatives – then there can be no question of a split or an estrangement. There is nowhere to go. All the same, family is family. This, of course, requires an internal commitment not only to ask forgiveness, but also to become reconciled, to restore one’s love for him in one’s soul and to draw nearer to one’s own love, since it is still there. When it comes to loved ones, then we already love them, which means that we must somehow purify that love, somehow draw closer to it, somehow find new means by which to live with this person. This, I think, is the most important thing. What if something thinks: “Well, I suppose I’ve forgiven him in my soul,” but decides not to say a word about wanting to be reconciled. How correct is this? How far removed is this from a real achievement? This, of course, is the avoidance of any real achievement and the avoidance of real life. It is as if I saw a very tasty dish on the table and ate it in my soul. In reality I would remain hungry. It is exactly the same thing here. What should one do if we do not feel ourselves guilty, but a loved one makes us ask forgiveness by manipulating us and calling into question our future relationship? Makes us? No, this is impossible. The decision to forgive and be reconciled with this person is born in the heart; no one can force me to do this. It might be another story if there are special circumstances, if for legal reasons one needs to offer repentance to someone or to seek reconciliation through the newspaper. But that is another story. Do understand that this is not forgiveness. There can be no sincere forgiveness where there is manipulation; before Lent we are talking about sincere forgiveness and sincere inner reconciliation, because all of Great Lent, strictly speaking, exists for this reason. Great Lent is not about formal things, but about internal things; it is only for oneself. Incidentally, the tradition of a general Rite of Forgiveness is very difficult in this sense, because it is one thing to ask forgiveness of one’s loved ones, and quite another thing to ask forgiveness of everyone in church. At least 80% of the people in church have never had anything to do with me. In this case I ask forgiveness of them formally, but this is only a formal rite. This is precisely what makes it a temptation for many people, since it seems like a formality. This is also a temptation for priests, by the way, since people from different parishes, from different regions of Moscow and even different cities, suddenly show up and also ask forgiveness, although this may be the only time in our lives that we will meet. This, of course, has a symbolic meaning, but none, of course, in a literal or substantial sense. The Rite of Forgiveness exists for entirely different ends. These are different things. The general Rite of Forgiveness has, of course, a formal character. The church is open to everyone, our parish does not have clearly defined boundaries, parishioners do not belong to only one parish, and therefore all kinds of different people might turn up for the Rite of Forgiveness. And, conversely, it could happen that those who would be very important to me might not be there. Therefore, when we celebrate the Rite of Forgiveness we offer the possibility for anyone to participate in it openly. Each person can independently determine the inner significance of this event for himself. He can then take the rite into the heart of his home, calling loved ones or asking forgiveness of them at home. But this does not relieve anyone of the necessity of performing this Rite of Forgiveness for oneself not just formally, but substantially, essentially, and fundamentally. This means that one has to prepare for it. This means that one needs to think ahead of time about with whom one needs to be reconciled and of whom one should ask forgiveness. Of course, while one is preparing one needs to place first and foremost the weightiest transgressions one has done to someone, the most difficult relationships, and then go in descending order. This is what requires the most amount of effort. Generally speaking, the main part of forgiveness is preparation: deciding that “yes, I want to be reconciled to this person, to repent before him, to ask forgiveness.” Second, there is the feeling from which this decision is born: this is the feeling of repentance, the desire for reconciliation, the desire to ask forgiveness. It is this inner desire, when it arises, which offers hope that the Rite of Forgiveness will be meaningful and substantial. Orthodoxy is dynamic, its liturgy is the vehicle of sacred mystery and truth, it faithfully re-presents the eternal and life giving Gospel with each generation – paradosis. It is multi cultural, it is the history of the faith of ancient Britain, it exhorts and disciples its children in lives of the blessed disciplines of chastity, fasting and prayer as commissioned in the Gospels. It has two thousand years of living history in the cultivation and nurturing of souls, and it is anything but tired. It is not a relic of the past but the action of God for each generation. As such it rejects anything which falls short of its explicit standards – and continues to bear fruit. It is not the place for theological catchphrase and riddles to advocate that which those outside would accept, but it has the maturity and Divine economy to deal with the world. Jarrod Ryder. Even if the Roman Catholic side recognises in some measure the Orthodox claims. The Filioque, for example, can’t stand as a distinct formulation. If they indeed mean the same thing as is argued (and St. Photios the Great would disagree if he were alive I think), then the Catholic Church ought to return to the Nicene formulation since they hold that council as authoritative as well. Another point. Catholic papal history has plenty of its own conflict between Church and State, or more specifically, King and Pope since the Church was perceived as a landed kingdom within landed kingdoms. Has he forgot about the Borgias, or the internal fractures leading to Avignon for example? There is always a certainty in the Pope as institutional head of a geographically universal Church in Catholic thinking. It’s from this standpoint that Orthodox ecclesiology seems in complete disarray. It’s true that Orthodox affairs are often in disarray, but it is not true that this apparent disunity fractures the Church. The evidence is in the worship. Even with a Pope, much of the Catholic Church lost its ancient Liturgy that has led to a very serious crisis of self-understanding among the Catholics themselves, a problem the Orthodox by and large don’t have. For the Orthodox, changing the Liturgy is, frankly, unthinkable. So while a Pope preserves a certain kind of order with the Catholic Church, the apparent disorder of Orthodoxy manages to preserve order too, what some would consider an order even more needful. From a comment by Fr. Johannes Jacobse. I think that there is a massive and deliberate misunderstanding in the USA of the position of Russia. I have studied the subject, and it is clear now that the communists in Russia are a very small percentage of the population. The US media has played up the protests in a couple of Russian cities, but they are in fact miniscule. What American sophisticated elitist media people hate is the fact that the Russian Orthodox Church is becoming VERY strong indeed and they absolutely refuse to understand that Putin and Medvedev are both personally strong Christians. It needs to be understood that Russia will NEVER be an American style democracy – for which I giver fervent thanks. The Russians understand that they need a strong leadership – the kind of guided democracy that they are getting. They are just beginning the long process of reinstating the monarchy as a Constitutional Monarchy – the first region has just passed the model legislation. Russia will in my view become a strong Christian bulwark. We need to take that into account – look at the map and see what a strong Christian Constitutional Monarchist democracy controlling its landmass could mean in geopolitical terms. It may not be apparent to people in the western media but the Russian Church is now present in the USA – with some millions of members and it stretches all around the world – in the UK and on the Continent. Looked at this way, provides an interestingly different slant on what is happening. “Ever since 1995 I have struggled to have plain English Catholic practices allied to strict Orthodox theology as the norm for Western Rite Orthodoxy. The strictly English Catholic would never tolerate the extra Roman innovatory devotions – there were no stations of the Cross or bleeding statues or birettas or lace or novenas or Benedictions or tabernacles or Big Six or any of this late post-reformation (mostly ultramontanist) papalism. A year ago, His Royal Highness Prince Michael of Kent expressed a wish to obtain a holy Orthodox icon as a gift for the Queen during his informal visit to the town of Nevjansk in Sverdloskiy Region. The Prince particularly liked one of the most highly cherished icons in Russia, Our Lady’s icon “Tenderness”. St. Seraphim of Sarov, a highly revered 19th-century Russian monk, kept it in his cell and treasured its healing power. He called this the ‘Tenderness icon’ representing Mary’s feelings of tenderness at the Annunciation, the “Joy of All Joys”. “Besides having a miraculous healing power, it also has a pacifying holy effect,” icon painters explained to the Prince. Painting the “Tenderness” icon for Her Majesty took Nevjansk icon painters almost a year. “It is an extremely time consuming process. The icon is made of copper, covered with braid gold and painted with special dyes made by a special formula minerals found only in the Urals”, they explained. The Queen’s Private Secretary’s office sent a formal letter to Nevjansk confirming that the icon had found its place in one of the Buckingham Palace halls. “Her Majesty sincerely thanks you for the miraculous icon, “ it said. Queen Elizabeth has already offered her prayers for her family and her subjects before the icon, Life.ru reports. Her Majesty’s husband Prince Philip was Baptised in the Orthodox Faith as an infant and his mother, Princess Alice of Battenburg became an Orthodox nun in later life. There is an Orthodox Chapel at Windsor Castle that was built especially for her when she visited the Royal Family. 1. We must begin with the premise that God designed Matrimony to be “Holy Matrimony,” that Eve was created from Adam, for Adam, and as such can never be separated from Adam in the Eyes of God. This is borne out by the word “A-dam” in Hebrew being itself a plural: Man and Woman is one A-dam. It is for this reason that the posssibility of Theosis exists in Holy Matrimony, in a way that it cannot do in “living together with benefits” or in homosexual relationships, no mattter how intentionally loving these might be. The form of Holy Matrimony of Man and Woman as Lord and Lady of Creation, to use the quaint mediaeval titles, symbolized by the crowing of bride and groom, is a necessary pre-requisite for the love that fills that form and that works out its salvation within the confines of that God-graced, God-ordained, God-blessed form. That said, like ordination, Holy Matrimony” is not a “sacrament necessary to salvation” as are Baptism and the Eucharist (from the Western perspective, at least) and a man or woman is free to hear God call him or her into Holy Matrimony, into Holy Orders, into the monastic life, even into the “untonsured” monastic life of service to those near or far, either for a time or for one’s lifetime. But it does remain the “normal” and “normative” model for both human relationships, as for divine ones, as between Christ and His Bride the Church (wherein there are so many distressing people with so many problems that I hardly know how to cope with them until I realise that I AM “them” and that I am likely a “problem” for many of them as they are for me, and this is the first step to reality, to repentance, and to humiility}. 2. Secondly, as most marriages (and we pray God this is so) result in the fruitful offspring of children, “Theosis” is often experienced in the “perilous paths of parenting” as much as it is in relations with one’s spouse. (The temptation for many couples is to turn their attention from their common spousal life in Christ to the “tasks” of “parenting the children” and “earning a living.” And thereby all: parents, children, grandparents, employers, fellow-employees, customers) are deprived of the blessings of Theosis in our lives as we relegate “family” and “work” to mere roles and refuse the Divine Energies pouring toward us through these situations.) It is always the child who causes us the most headaches, who asks the infernal “why?” repeatedly (and sincerely), who is as headstrong as we ourselves are, who takes on our unlovely qualities of manipulation of our spouse as the “right way to have a romantic relationship”; it is THIS child that God is at work through in our own lives if we will have the humility to accept this and to be changed into “the image and likeness of Christ” in the life and for the sake of that particular child. Each child has different psychological needs and so “being fair” does not mean “everyone gets the same thing,” as tempting as that is to pull on the parental “Because I said so.” Each child’s special makeup, a soul made uniquely by God for THAT child is His gift to us, and his invitation to come “Higher up! Further in!” to the ineffable light of His love. “After all, before God we all stand in line not by the order of our ordination, and not by the number of crosses, and not by whether you serve in a mitre or kamilavka. It may come to pass that the Patriarch will be standing behind a cleaning lady and will look into her eyes and say: “Maria Ivanovna, could you pray for me …” Patriarch Kyrill of Moscow. The Paradox of Grades: Many people assume that if you receive an “A”, then you have mastered the material. Unfortunately, very few teachers have the time, the opportunity, or the ability to design a class that measures learning and conceptual thinking. No test can cover all the facts in a given topic, so the teacher must decide which facts to test. Homework and tests then become exercises in fact-finding, instead of yardsticks to measure students’ progress as they integrate facts into larger concepts. The goal of learning is then shifted from developing understanding to finding the information that the teacher wants. After years of conditioning, students become habituated to this process and start to learn only the facts that they think will be tested. Tackling complicated problems—without a certain result—appears inefficient, if not counterproductive. An inverse relationship starts to manifest between academic success and learning: those who succeed academically cannot reason independently, and those who can think independently cannot succeed academically. The evidence for this dichotomy is overwhelming as one listens to successful inventors, innovators, and entrepreneurs when they discuss their conflicted experiences in the educational system. They will even go far as to state that their success has come despite of what they learned in school, rather than because of it. The Celts – the Early British Church had a saying about “thin places” – the concept that there seemed to be some very few places on this earth where the division between the Heavenly dimension and the worldly dimension seemed very thin indeed – where it was possible to see transition – to understand more easily the Heavenly dimension. There are indeed such places, for some reason they are easier to pray in – not “easy” like a quiet chapel or inspirational building – but “easy” as in the division “seems’ thin. Such places vary – some find it on a particular mountain – some find it in a real desert, some find it in one of those places where sea, land and sky seem to merge, it matters not. The scientists now seem to agree with Saint Paul, that there are indeed at least four more dimensions in this universe, and that the universe as we know it could not continue to exist if they were not there. We Christians know that perfectly well – that without these dimensions of Heaven, this universe would no longer exist. The universe is stupendously immense – we learn that from the modern sciences – we may never be able to discern how far the universe extends, we may never see with our telescopes the farthest star. It is beyond our educated imaginings. Yet, here, sitting in some thin place, we feel close – very close to the dimension of Heaven which encompasses the entirety of this stupendous cosmos. We feel exceedingly close to God – closer than elsewhere, close to His intentions for us, close to His thinking for us, close in every way – and drawn to His dimension – a far better place to be – a place to be desired with our whole being. This God, this Master of the universe, our God, our Master, whom we can scarcely comprehend is there, close, accessible, waiting. We draw near, we pray not with words but with our desire to be with Him, to be as like Him as He desires us to be. This is indeed a thin place. The Holy Disciple from among the Seventy Aristobulus, Bishop of Britanium (Britain), was born on Cyprus. Together with his brother, the holy Disciple from among the 70, Barnabus, he accompanied the holy Apostle Paul on his journeys. Saint Aristobulus is mentioned by the Apostle Paul in the Epistle to the Romans (Rom 16: 10). 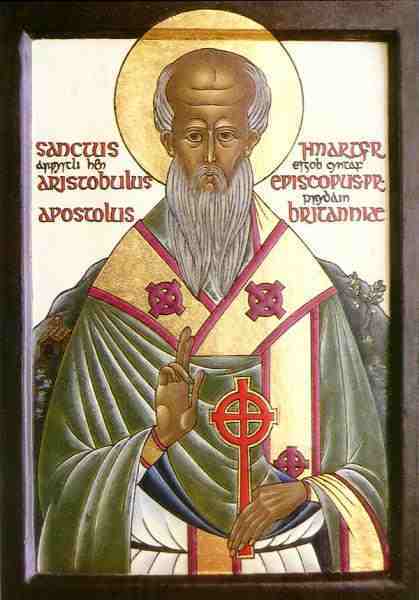 The Apostle Paul made Saint Aristobulus a bishop and the Church at Tyre sent him to preach the Gospel in Britanium (as is recounted by Saint Dorotheus, Bishop of Tyre), where he set up in the south-east of Wales and Somerset and converted many to Christ, setting up The Church in the British Isles in AD 37, for which he suffered persecution by the pagans. Saint Aristoboulus died in Britain. His memory is on the 31st of October and on the 4th of January and also in the Assembly of the 70 Disciples. In the commentary of Blessed Theophylact, he makes a point about the verb translated by the KJV in the passive voice as “shall be required”, but he points out that that it is is in the active voice, third person, plural — and so should be “they shall require”. The Law which governed Israel as a theocracy from the time of Moses until the time of Christ foreshadowed Christ. The Jubilee Year, (the acceptable year of the Lord) brought freedom from financial debts. Christ is our freedom from our debts to God: The offences which we have committed throughout our lives. Here we see Christ’s fulfillment of all of the Old Testament’s Law. “Advent” means “coming.” Christ comes to man in Bethlehem, in His Word and He will come again on Judgment Day. We in Advent look forward to that Second Coming and we prepare ourselves as we await Him. Not only does Christ fulfill all of the Old Testament Law, but He fulfills all the Messianic Promises in the Old Testament. In the above text He fulfills Isaiah 61:1-3. In Acts 10:43 Peter said: “To Him all the prophets witness that, through His Name, whoever believes in Him will receive the remission of sins.” Jesus said (John 5:39): “Search the Scriptures, for in them you think you have eternal life; and these are they which testify of Me.” In Luke 24:27 we are told: “And beginning at Moses and all the prophets, He (Christ) expounded to them in all the Scriptures the things concerning Himself.” Verse 18 of our text plainly mentions all three persons of the Trinity just as do John 14:16 and 15:26. The beginning of Advent is the first day of the new Church year. behest of the conquering Seleucid Greek emperor Antiochus IV. culture taken away by these “strangers” and replaced with alien concepts. Incarnation, the coming of the Messiah: God incarnate. appropriate to read of Mattathias and the events before Christ’s Nativity. appointed tasks as best we can. call our society back to the Christian Way? And if not, why not. And it is this same path of inner knowledge of God (with all its components) that is the proper context of fasting. If we fast but do not forgive our enemies – our fasting is of no use. If we fast and do not find it drawing us into humility – our fasting is of no use. If our fasting does not make us yet more keenly aware of the fact that we are sinful before all and responsible to all then it is of no benefit. If our fasting does not unite us with the life of God – which is meek and lowly – then it is again of no benefit. I see people in England, who come from the English Catholic stream of Anglicanism, who are confused by the antics of Anglicanism, who know its wrong, and who see no option but to go to the pope. They simply do not understand that there was a good reason why generations of their people – both since the reformation – and for a thousand years before the Normans, felt that the pope might be a nice chap over there in Italy, but they had their own Patriarch in Canterbury and needed to look no further than him. Obviously that man is Canterbury is no longer viable and hasn’t been so for some time. They simply don’t realise that the best option for them is Western Rite Orthodoxy. If they crave monasticism – we have that too, and we would like nothing better than to start a monastery in England. We seek to restore the faith of our fathers prior to the Norman invasion, with the help of a monastic-led Church – and that is what we want now. The Church has always run in spite of the bishops. The ideal of the Early Church bishop – the father around whom the Church gathered is lost. In the Early Church – the Bishop was like the Victorian Vicar of a town – he was The Church in that place – but a Vicar – a father, and his diocese was all in his reach. Dioceses have become too large and bishops have become too important. We need to go back to tiny dioceses and lots and lots of Bishops – Vicars of towns. That way the office of bishop would become politically insignificant and therefore not the subject of unseemly political campaigns and the wrong sort of men achieving such promotion. After the demise of the Byzantine Empire, first the Patriarchs then the bishops started dressing in the emperor’s clothes (literally) and then they thought of themselves as even more important. The top of the pyramid in fact. Its all very well for those of us who have made the journey to Orthodoxy, to glory in the fact that we are now undoubtedly in The Church. However, we need to keep in mind our brethren left “behind”. There are many members (for instance) of the Church of England who become very hostile indeed when informed that they are not in the Catholic Church, and understandably so. They have been earnestly taught all their lives, that they are in a legitimate branch of the Catholic Church. It is not their fault that this is not true, they didn’t dream up a lie. They are not liars, they have for generations simply been misinformed. That is not something that we Orthodox should hold against them. We ourselves are converts – in fact all Orthodox Christians are converts – none is born Orthodox – all must be Baptised into the Orthodox Church. So we must deal gently and generously with all our fellow-Christians. Many of them are far better at attempting the Christian Way than we are. Many of them may be saints in the eyes of God. We may indeed be quite upset at the people that God expects us to share heaven with. What we have to offer these people who would be Christians – but are outside The Church is the fact that inside The Church – and only inside The Church can they be assured that God’s grace is present and freely available. The path to living Christ’s Way is easier and The Church has the Divine medicine that we all need. Orthodoxy is not “1/2 of the Church that Jesus founded”. The Roman Patriarchate (the smaller faction of The Church at that point) broke away from the other four Patriarchates and became schismatic. Surely we can’t imagine this one Patriarchate breaking from the other four, to still be The Church can we? Jesus likely did not think in terms of the organisational structures that the western churches now have – He taught us The Way – a way of life not a religion. Orthodoxy is however different from the western ideas of “Church” in that we do not have a pyramidal structure – our bishops are in the centre of a flat organisation with the Church gathered around them. Our Patriarchs are definitely not popes. We still teach The Way – as a reading of our Early Church fathers, patriarchs and Elders (ancient and modern) will tell you. Rowan Williams is a very good example of a man in entirely the wrong job. He probably should never have allowed himself to be consecrated at all in the first place. As a theoretician, he might have followed his first instincts (as evidenced by his doctoral thesis on Lossky’s version of Orthodox theology) into the Holy Orthodox Church – a place where a lot of former Anglicans – both evangelical and Anglo-Catholic are finding an incredible peace. They find upon joining, a huge burden is lifted, because they know now that they are finally in the Church which was actually founded by Christ and which continues to teach the original faith in its entirety. Rowan is ultimately an honest man, but he is no politician – and his job requires that he be a politician just like those in Westminster – and he can’t do that.